Greetings one and all from Bonny Scotland, the next few blog entries are coming to you live from the hometown of Andy Murray, 2013 Wimbledon champion, Dunblane! The girls and I are in Scotland visiting family and taking in the cool summer days and grilling at night to keep warm. 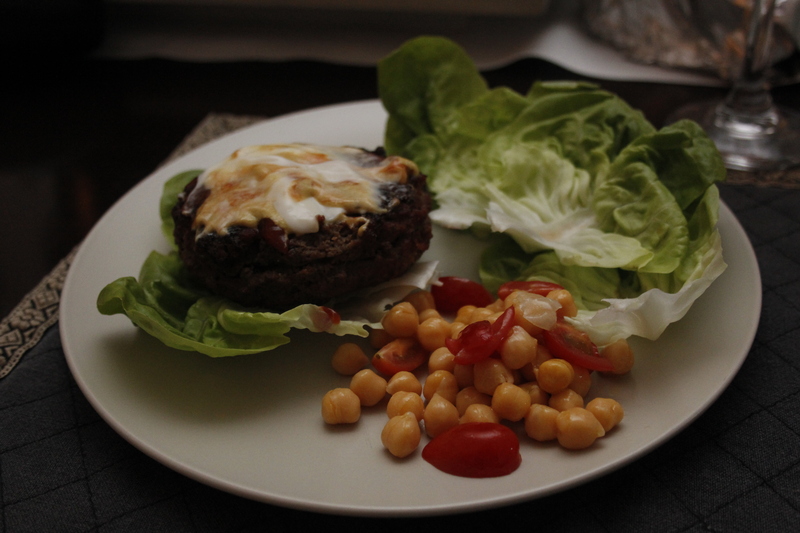 Last night the clans Brown and Hendry partook in one of our favourite and simple meals…the BOG burgers! The result? Bliss and plenty of seconds! I spent the morning prepping my favourite rub and Heather’s favourite KC BBQ sauce. 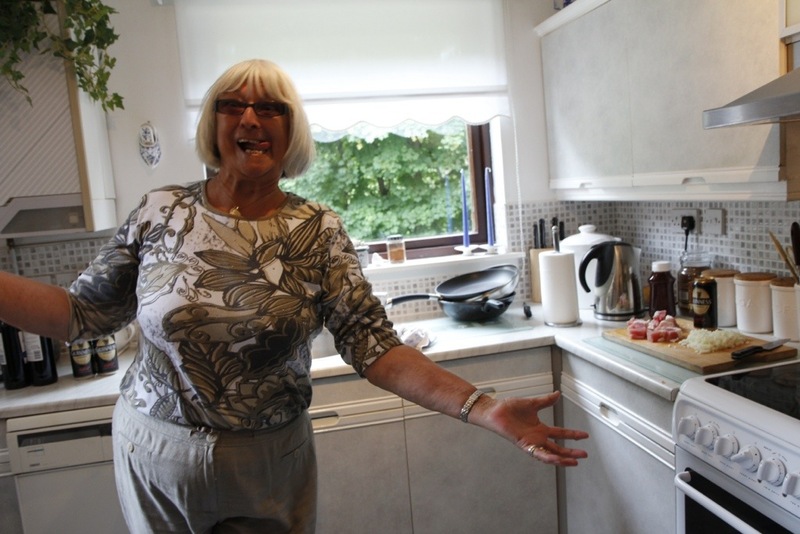 That done I explained to my helper (Maw Broon) step by step how to prepare the best burgers you’ll ever have! First prep the BOG by frying up the onions and bacon. Once fried to about halfway (i.e. the onions are just starting to turn translucent) add in your Guinness. Reduce the mixture over the next 25-30 minutes. Once done, set aside the mixture until it cools to room temperature then pulse it with a hand blender until it turns into the consistency of a poopy nappy! Now add that mixture to the beef and pork mince and really work it with your hands to combine it. Add your rub and maybe a quick dash of salt and start to form your patties. Place them on a plate, cover with cling film and pop them back into the fridge. We fired up Papa’s gas grill to 500F and then prepped the patties with a quick brush of olive oil and a dash of rub. I grilled the burgers for about 15 minutes tuning every 5 minutes. I kept them going until I reached an internal temperature of 150F. We added a few slices of Scottish cheddar and toasted up a few buns and dinner was served, along with Heather’s tattie wedges! All in all, success even on a gas grill! 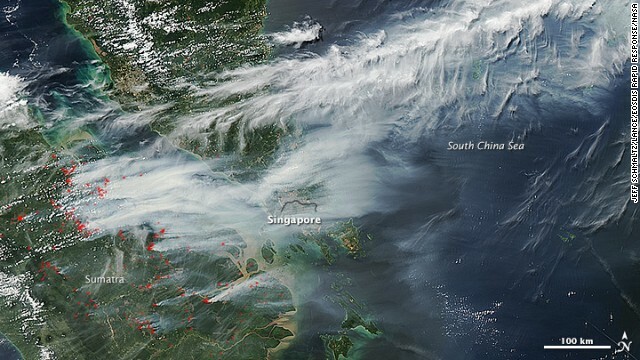 As Singapore remains choked by toxic haze blowing our way from the illegal slash and burn deforestation in Sumatra, we decided to host a dinner party with our friends the Cowan family. Tonight’s dish is a variant of our favorite burgers, the BOGs (Bacon, onion and Guinness) however in honour of our ridiculously polluted environment, we’ve renamed them SMOG burgers! It’s also important to note that by way of family protest, senior Indonesian minister Agung Laksono, one of the men responsible for this environmental catastrophe, is NOT invited to dinner tonight and is hereby permanently and forevermore banned from sharing meals with us!!!! Start by roughly chopping up the onions frying them together over medium high heat with the bacon in a deep frying pan. Let it all fry up together until the onions start to turn a bit more translucent and the bacon starts to really sweat. I’d say about half way to what would normally be considered “done” will do it. At this point, add the can of Guinness and give it a bit of a stir. Initially it’ll foam up but after a few seconds will subside, at which point reduce to a medium heat, put a lid on the pan and let it cook for another 15 minutes. Now take the lid off and let the liquid reduce but not fully. You want a little bit of Guinness left over however it’ll thicken up into a delicious irony gravy! Once reduced, take the pan off the heat and transfer all the yumminess to a plastic bowl and let it cool down to room temperature. When your mixture has cooled down, take a bit at time and pulse it in a food processor for about 10 short bursts. Do this for all of the mixture and set it aside. Now take your beef and pork mince and start to blend the two. Make sure you get an equal distribution of pork into the beef mince. Now as you’re mixing this (and I found that doing it by hand, wearing surgical gloves works best) sprinkle about a tablespoon of rub over the surface and continue mixing. Keep doing this until you’ve evenly mixed in the 4 tablespoons of rub. Now add your BOG mixture (your bacon, onion and Guinness) and ensure you’ve mixed it all in completely and thoroughly. You’re in for a bit of a workout to get it all blended in nicely. Now to ensure you’ve got even sized patties, take a ring mould and place a small sheet of cling film into it. Scoop out a handful of the mixed meat and fill the ring mould 3/4 of the way in depth and press firmly to form a thick patty. Then simply lift the cling film and the patty will fall out into your hand. Place the patties on a cookie sheet lined with baking paper and then cover the sheet with cling flim. 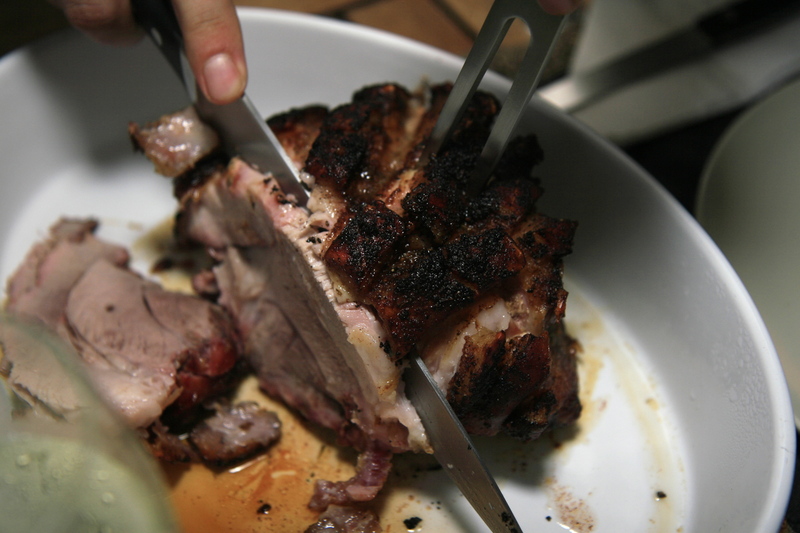 Chuck it all into the fridge until you’re ready to grill. And now to grill! I got the BGE up to 500 degrees and made sure the grates were nicely oiled. I made sure that each of the patties was indented in the middle. That helps you get an even looking burger once grilled and not something that looks like a Jiffypop popcorn thingy. Lightly coat the patties with some olive oil and a sprinkle a pinch of Kosher salt over them and put them on the hot grid. Keep the burgers going for about four minutes then flip them over for another four minutes. 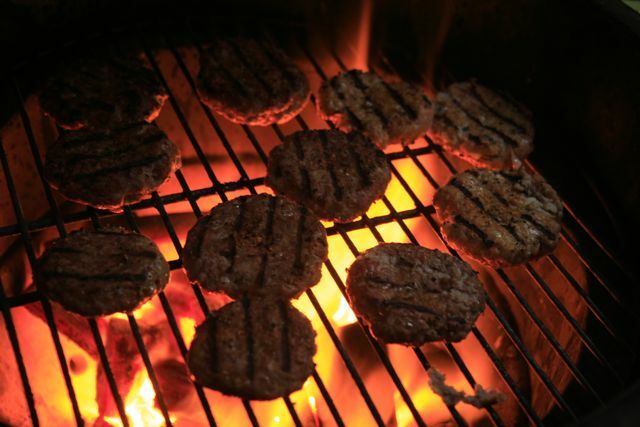 USDA recommendations for burgers state that you should aim to hit an internal temperature of 160F so if you have, and you really should have a digital thermometer, give them a check once you’ve grilled both sides. Toast your buns for about 25 seconds, add some shredded cheese and a bit of tomato, lettuce, mayo, and homemade bbq sauce and serve the masses! Cheers and here’s praying for some fresh air soon! Kayan took over from Heather tonight. The best quote ever from our young guest was “these are the BEST things I’ve ever eaten!” He grabbed seconds an hour later! 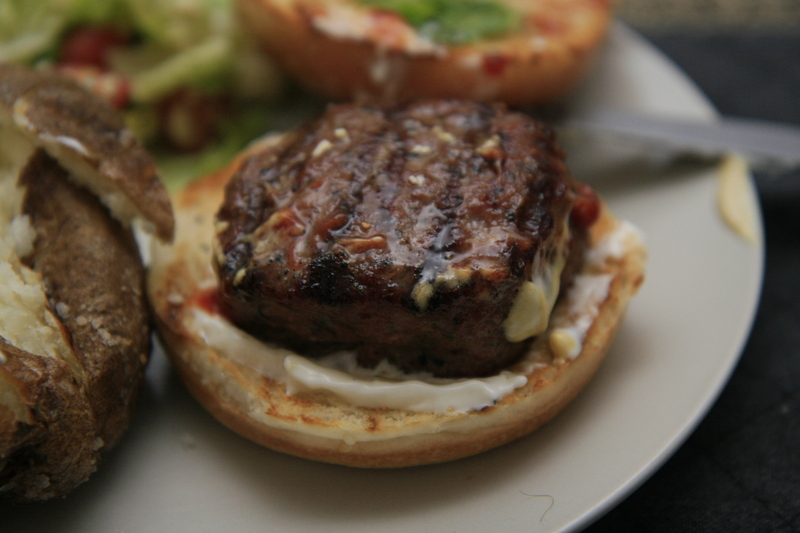 So last night Heather and I tried a new tool out, the Williams & Sonoma “Stuffed” Burger Press. I’d give it a 6/10 for performance but for $18 who can complain? The point is though, that it did what it was supposed to do and that was, to produce an amazing burger filled with yummy goodness inside. In a large mixing bowl, combine all of the ingredients above, save for the bacon and cheese, that you’ll do just before you grill. Once the mince is combined with all the ingredients, let it rest in the fridge in a zip top bag for about thirty minutes. When ready, pull out your mince and get your press ready, that is, grease it a bit with some olive oil. This ensures the patties come out nicely instead of a sticky mess (which was exactly what happened with our first attempt!) Add enough meat into each of the halves, then to each side, press the “well maker” which makes a nifty little nook for the inside goodness. Fill that with a bit of bacon and a bit of cheese and crimp the press together. Voila. Pat the patties together a bit more (this is where the press kind of fails) but if you don’t mind this step, you’ll save yourself your burgers falling apart. I grilled the burgers for 2.5 minutes per side at 400 degrees F and then let them rest for another 2 minutes. The result? Big smiles all the way around. Also, in an attempt to lower our carb intake, we used two lettuce leaves instead of buns and it all turned out wonderfully well. Check out the photos below! In hopes of getting a huge discount, I’m dedicating this blog entry to the always nutty folks at The Butcher located on 44 Jalan Merah Saga right in the heart of Chip Bee Gardens in Singapore. The lads there are always ready for a bit of banter and they consistently provide good suggestions when it comes to grilling different cuts of meat. I left the guys our blog address to have a peek…so if you’re reading boys, I need a discount on all the charcoal I buy from you! Anyway I digress, last night being a lazy Friday night, I walked up to The Butcher and grabbed 6 pre-made lamb burger patties – they’re a wonderful blend of lamb mince, rosemary and mint. Once at home I set the BGE at 400 degrees F, and the burgs were done perfectly at 4 minutes per side. I let them rest for about 3 minutes under some aluminium foil and a tea towel. Once ready to serve, we cut up some homemade buns, added a bit of Brett’s salad and a couple of big russet potatoes. Juicy is the operative word when it comes to these lamburgers! 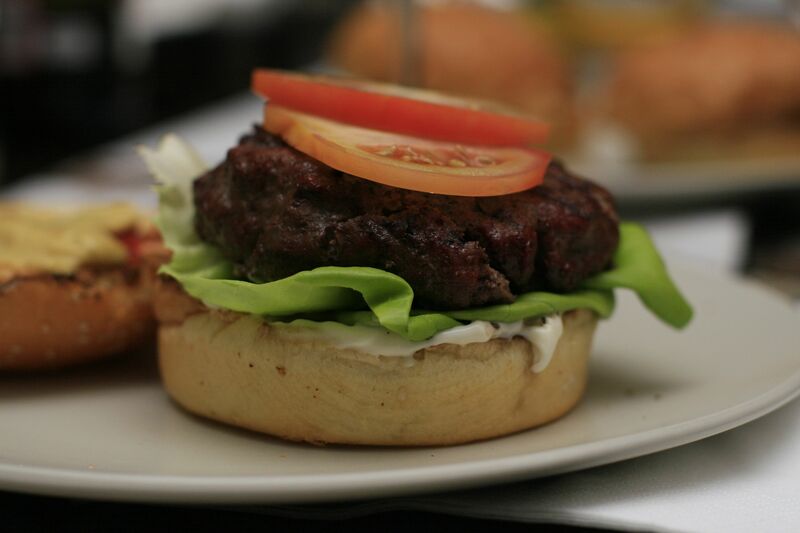 The Big Green Egg simply doesn’t dry anything out and as a result, we had the best “lamburgers” money can buy. PS – BIG THANKS to our guests for the evening, auntie Barbara and uncle Brett. We had a great day and looking forward to brunch and hockey tomorrow morning! GO VANCOUVER! 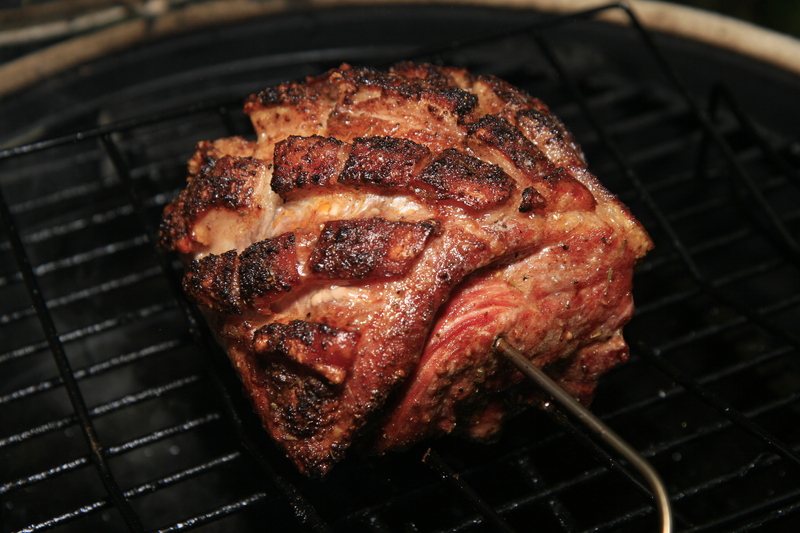 MMMMM….It’s Friday and it’s time to chow down on some good grillin’! Alex (our 13 year old) suggested we embark on a new burger recipe. When I found the BOG recipe from the Eggtoberfest 2oo9 collection of recipes, we knew we had a winner. Bacon, Onion and Guinness….what a combination. Fry the onion and bacon until about halfway done, then add the beer. Cook until beer is reduced. Cool, then combine in food processor until chunky. Combine with ground beef. Let the meat mixture rest for a few hours in the fridge. Form into small patties and cook at 400 degrees until the burgers “sweat” (about 4 minutes), then flip them and cook about 4 more minutes. Serve on small dinner rolls. I made six burgers with only half the recipe – don’t be fooled by the above – clearly this was written by someone either in Texas or with an incredible appetite. Half it and you’ll do just fine for a family of 4 – we now have enough beef mince for at least 6 more burgers. Burp! I love mid-week eggness because both Roman and I work it means we usually leave egg cooking until the weekend when we have the time to relax. However we had a craving for hamburgers of the homemade variety and as usual some egg based goodness ensued. Wash the potatoes thoroughly. When dry, coat the skins with olive oil and sprinkle with kosher salt. Set the EGG® for indirect cooking at 400°F and bake potatoes about one hour until tender all the way through. Reduce the temperature to 350°F. Remove potatoes and cut in half lengthwise; scoop out the insides into a mixing bowl, leaving about 1/4-inch of potato and skin all around. Using an electric mixer combine the potatoes and butter for 1 minute until the butter melts. Slowly add the whipping cream and beat until smooth. 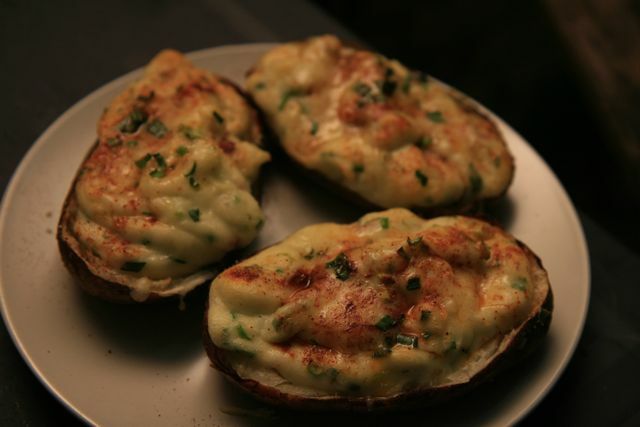 Sprinkle 1/2 cup of the cheese into the halved potato skins. Spoon in the potato mixture (or use a piping bag) to fill the skins level with the top. Sprinkle the remaining cheese and the paprika on the potatoes. Put the potatoes back in the 350°F EGG and bake 15 to 20 minutes until the cheese is melted.